We are engaged in manufacturing and supplying of high quality tungsten carbide components. the tungsten carbide components are extensively used in various industries, owing to their effectiveness, longer shelf life and environment friendly nature. besides, the tungsten carbide components are packed by making use of superior quality packaging material. Wear Parts are treated as miscellaneous use of carbide. Mostly these are suggested to intermittent loading, fatigue or to corrosive environments. 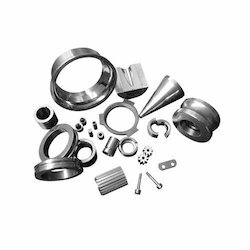 We manufacture sintered as well as finished wear parts for following industrial sectors. Automobile, Textile, Razor Blades, Measuring inserts, Cigarette_ , Steel Tubes, Sealrings. We are instrumental in offering a quality range of ISO Tungsten Carbide Threaded Inserts. Our vendors make use of premium quality-approved raw material using latest machines. The quality experts working with us test the entire procured range on various parameters to make sure the same are free from defect. We deal with all types of carbide inserts. Complete tungsten carbide program for foundation drilling/road milling/trenching tunnelling/surface mining and mining operations. Sandvik has manufactured cemented carbide components used in engines, helicopters and airplanes for over two decades. The strength and wear resistance of cemented carbide make it the best choice for aerospace components, as other materials cannot withstand the tough environmental conditions. The properties of cemented carbide allow it to adapt to conditions as equipment performance intensifies. - T.C. Balls, T.C. Ball mill. We are well reckoned as one of the supreme solid carbide threading inserts suppliers in India. Our Carbide Threading Inserts are cost efficient inserts that have long lasting life and high quality. Our Carbide Threading Inserts provide superior quality cutting edge. We offer Carbide Threading Inserts at very reasonable prices and that too within the specified time frame.